Nothing wrong with the cabinets below, though the owner preferred to give an updated look and function. 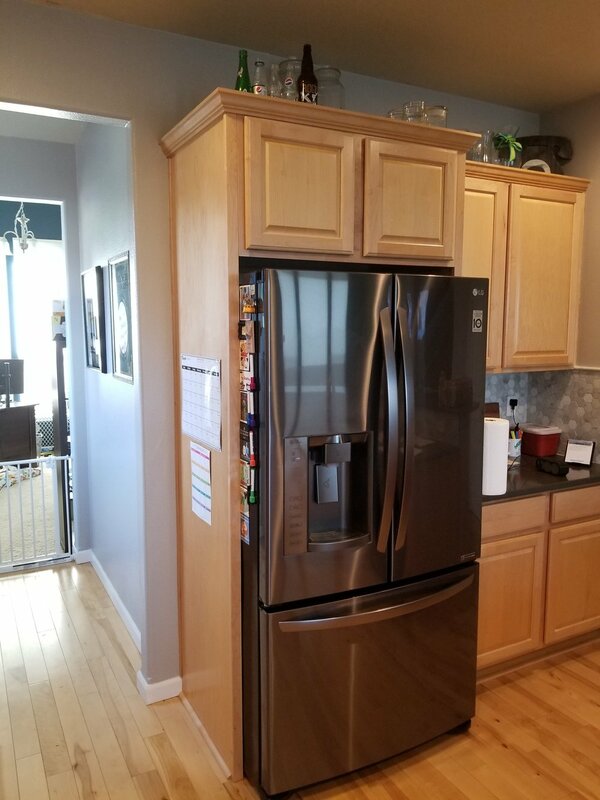 “I still can’t believe this is my kitchen!” - Lisa A. Sometimes there is just not a lot to save, the cabinets were falling apart, tile countertop, old floor…. Here it is better realizing your dreams from a clean slate. We designed a new kitchen with all new plywood/hardwood built cabinets from Canyon Creek, new laminate floor, and custom selected granite slabs with matching waterfall and window ledge. Sometimes there’s not a lot worth saving…. Only the range/microwave stays! Corner optimizer easily swings out, cabinets are horizontal grain Sapele. Simplify Your Stuff specializes in making your cabinets function well! We can replace your existing clunky drawers with new dovetail soft close drawers that you will love. We also can add all kinds of organizing accessories, talk to us!